I decided to tackle the task of installing the new headliner myself. I removed the original headliner and old insulation. To replace the insulation, I used 2 $4 foldable silver windshield heat deflectors, cut them, and used contact cement to glue them in place. 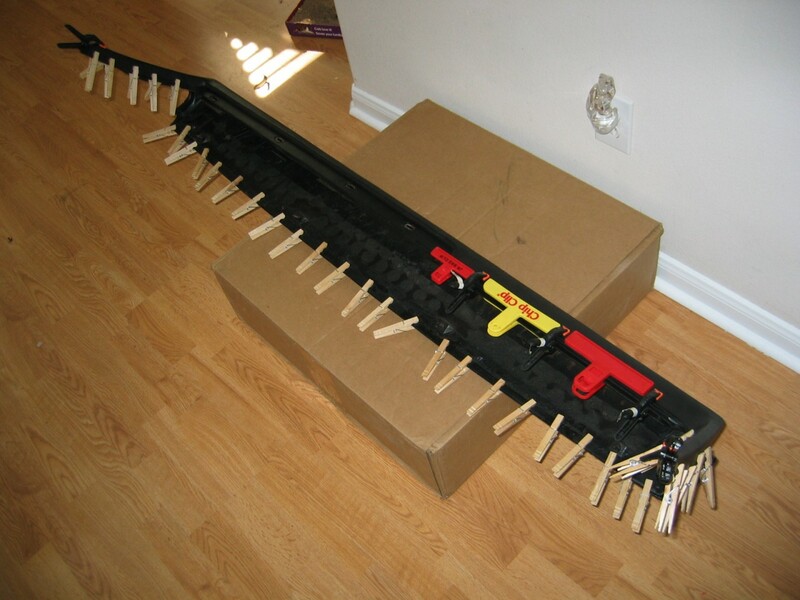 I also replaced all the plastic clips that hold the metal bows in place. When you take out the old headliner, make sure you mark the location of each of the metal bows. 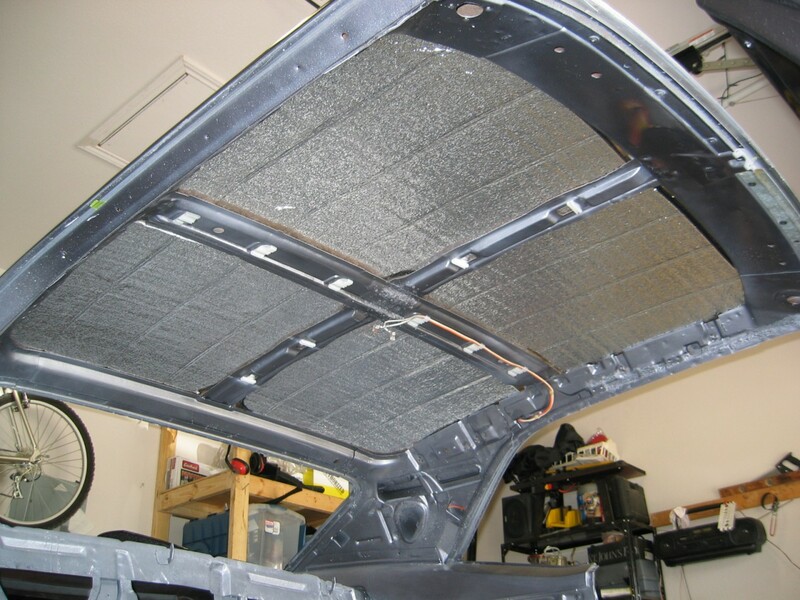 This is very important when you re-install the new headliner, because if you get the bows out of order, the headliner will not install correctly. 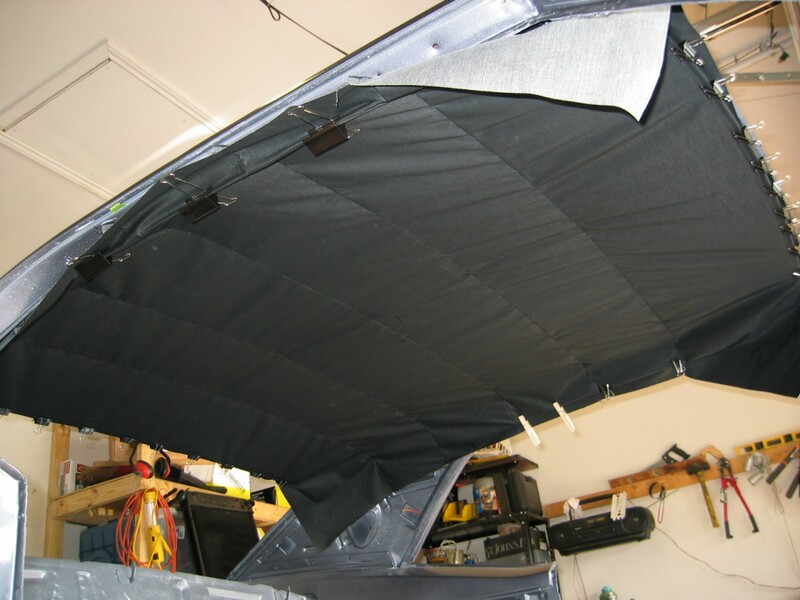 Here is the new headliner in place, but it has not been cut or stretched yet. I found the easiest things to hold the headliner in place while working are binder clips and clothes pins. The hardest part of installing the headliner was getting it to stretch correctly. Slowly work front-to-back, and then center-to-side. The small amount of slack you see in this picture eventually went away. 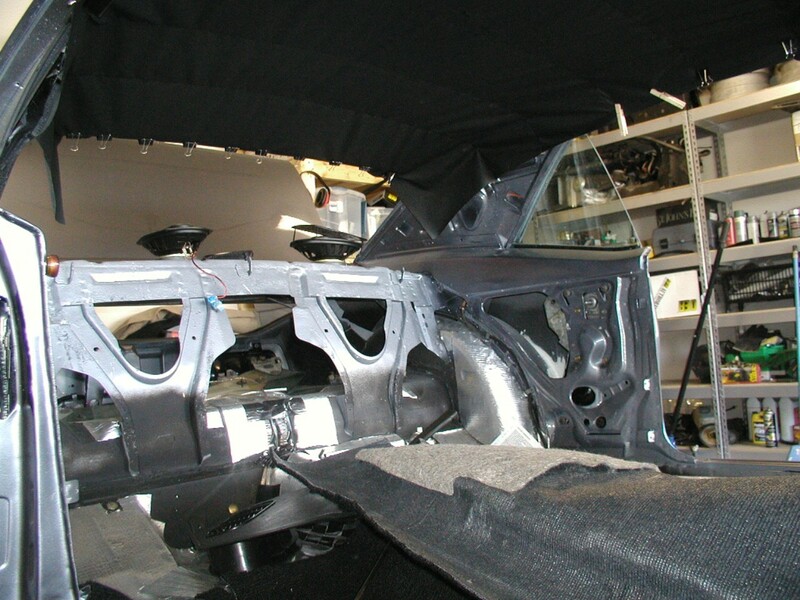 The complete floorpan of the car was covered in undercoating right before it left the paint and body shop. New floorpan plugs were installed. 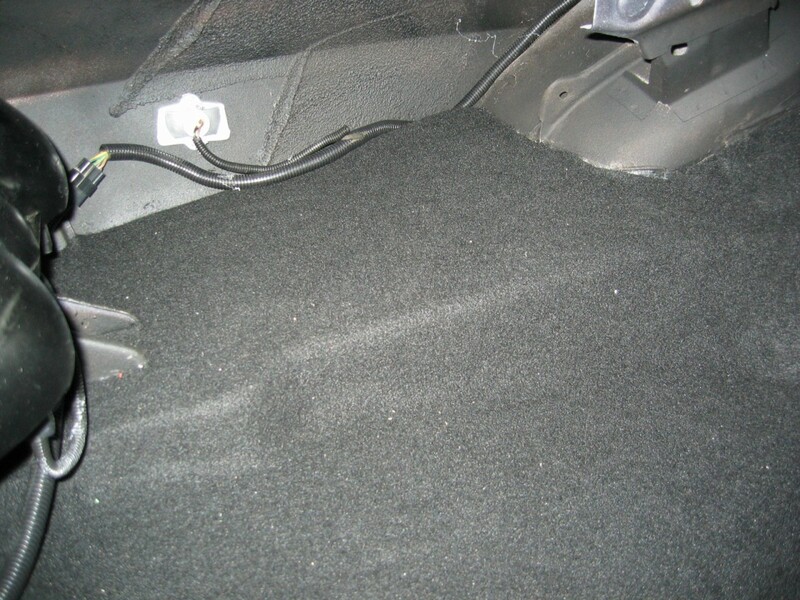 The entire floor of the car was covered in two layers of eDead Sound Deadening. 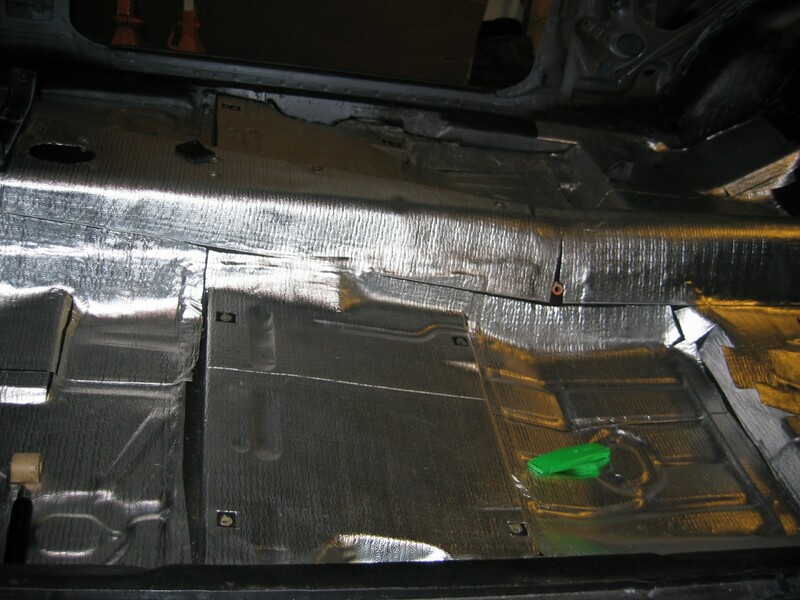 It is used for heat resistance and sound deadening. This product is very similar to Dynamat, but costs about 60% less. 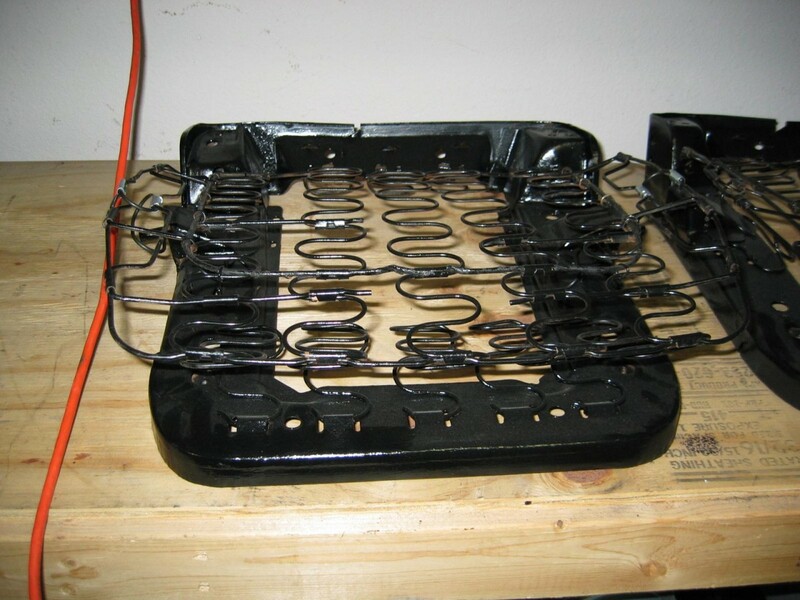 The product installed very easily and works well. 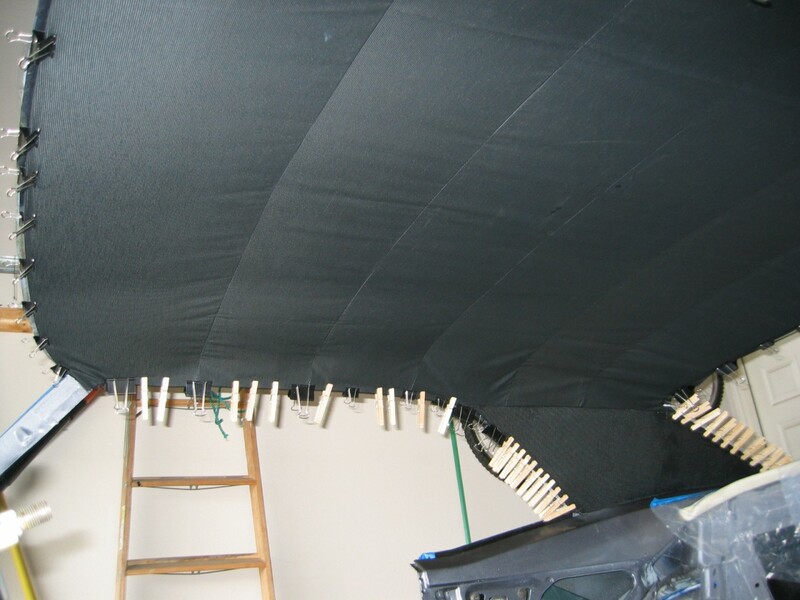 I used approximately 90 sq/ft to complete two layers. As many people know, original dashpads tend to crack and fade over time, especially in the sun and heat. Instead of spending $400+ refinishing my old dashpad, I ordered a $89 molded plastic dash cover from DashTops. 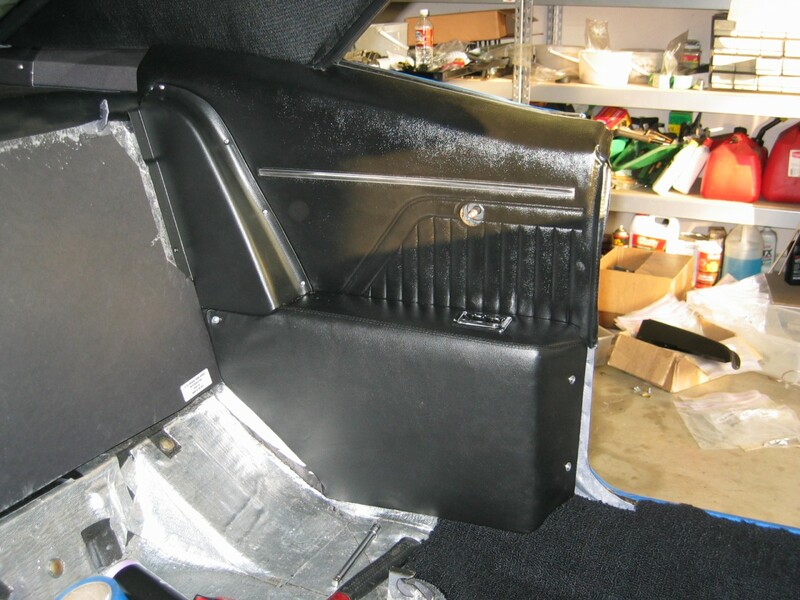 This cover glues ontop of the original dashpad and offers a durable hard plastic finish that looks great. This picture was taken the day I started to install the new carpet. 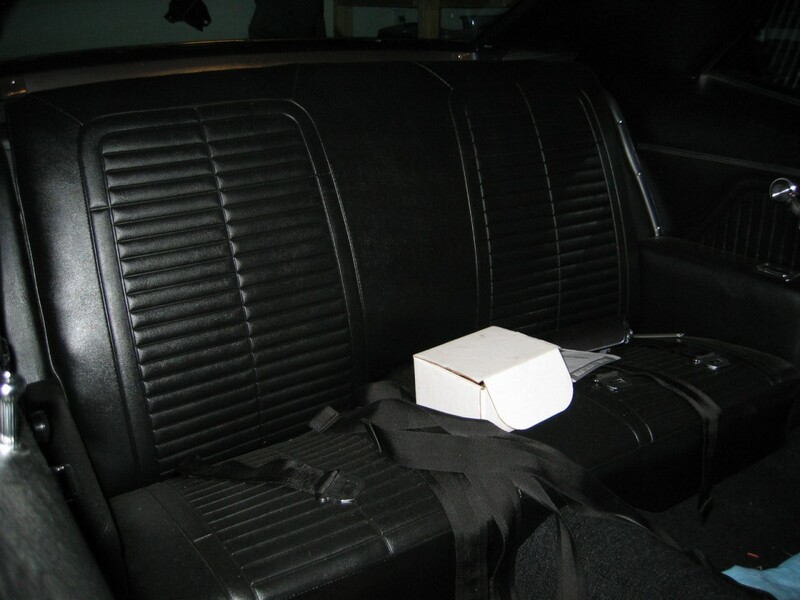 The kit contained two seperate molded carpet pieces with jute padding attached. I purchased the new carpet kit from Classic Industries. The fit was very nice, and it installed easily. 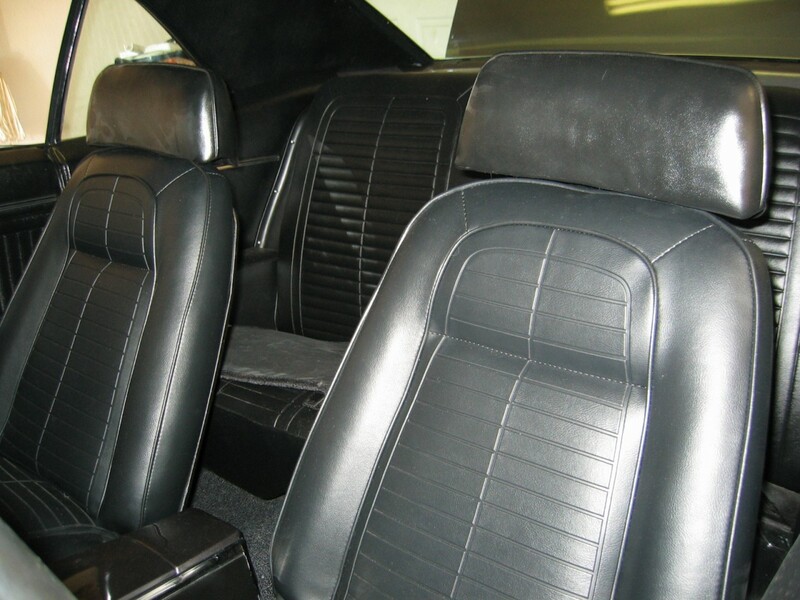 I took both front seats completely apart to repair and reupholster. 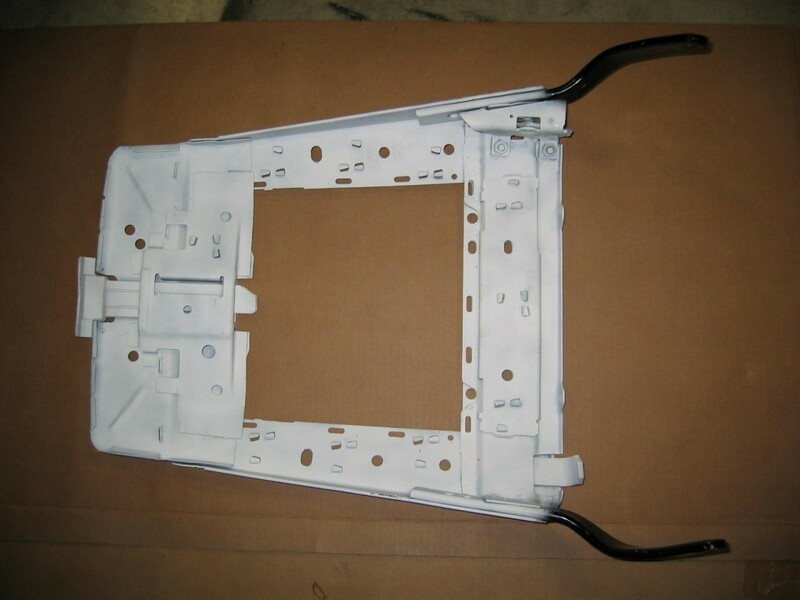 The driver's seat-bottom frame needed to have both side springs replaced. After all repair work was completed on the seat frames, they were painted. I also took apart the seat backs and painted those frames too. After repairing the frames and the springs, the seat were re-assembled. I purchased new foam and vinyl material to reuphoster both front seats. All window regulators were removed, cleaned, and lubed with white lithium grease. Also, all window glass was removed, cleaned, and polished with a Rhodite polishing compound. The results on the glass were spectacular. All the small scratch marks and haze were completely removed. Finally, the standard tar paper waterproofing was installed. After restoring the window regulators and glass, I installed the rear quarter inner panels. I used all of the original pieces from the car, after I did work on them. All the vinyl was cleaned, re-glued to the metal or cardboard form, and then painted with SEM Flexible Paint. The metal pieces were sandblasted, cleaned, and painted. 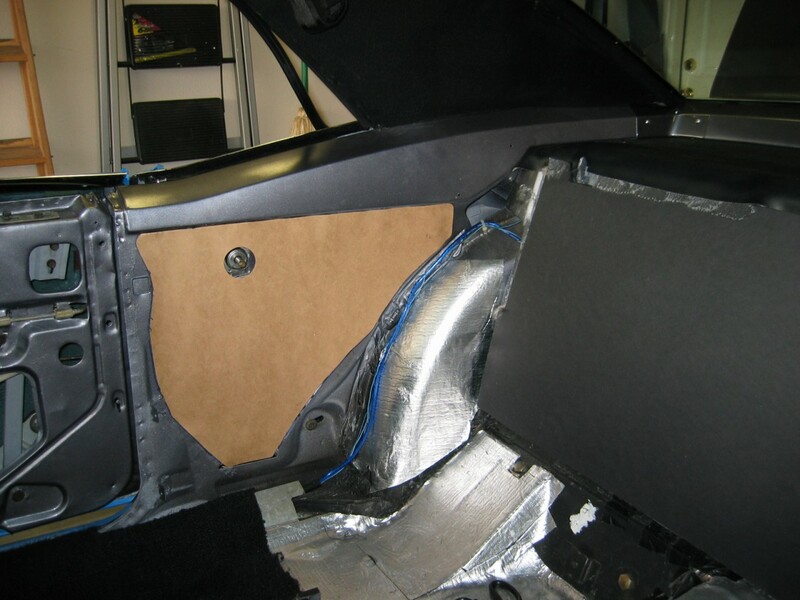 No, these are NOT new door panels. 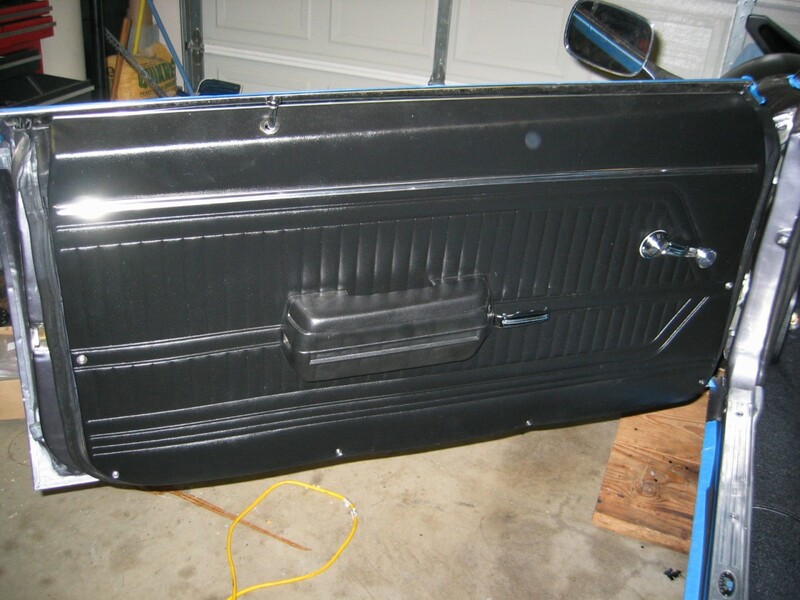 These are the original gold door panels that I cleaned, prepped, and painted with SEM Flexible Paint. I installed new window regulator knobs, armrests, door handles, and lock knobs, but everything else on the door panel is original material. Here is the mostly completed interior. 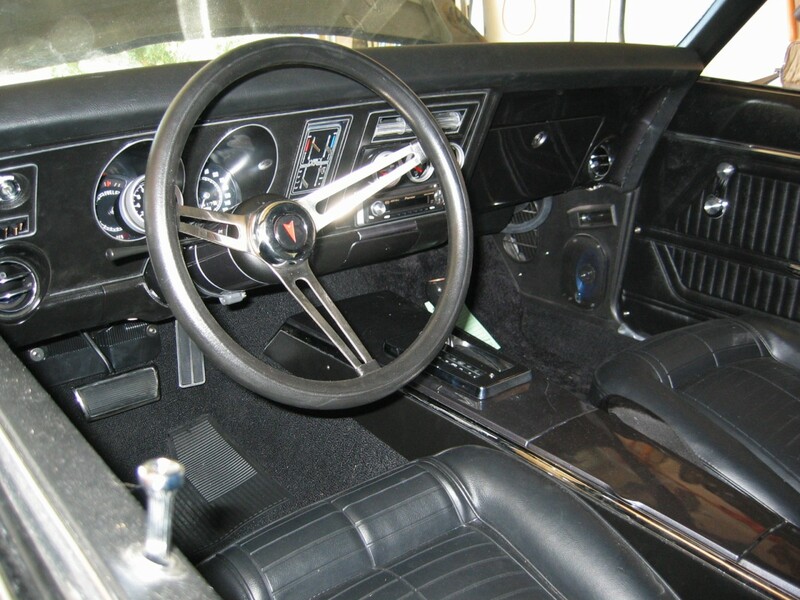 The modifcations from stock are as follows: added a tach, added Vintage Air to clock delete, added tripple gauge cluster to original A/C controls, added modern radio, new steering wheel, new 4-speed shifter detent, custom painted center console, and custom kick panels. 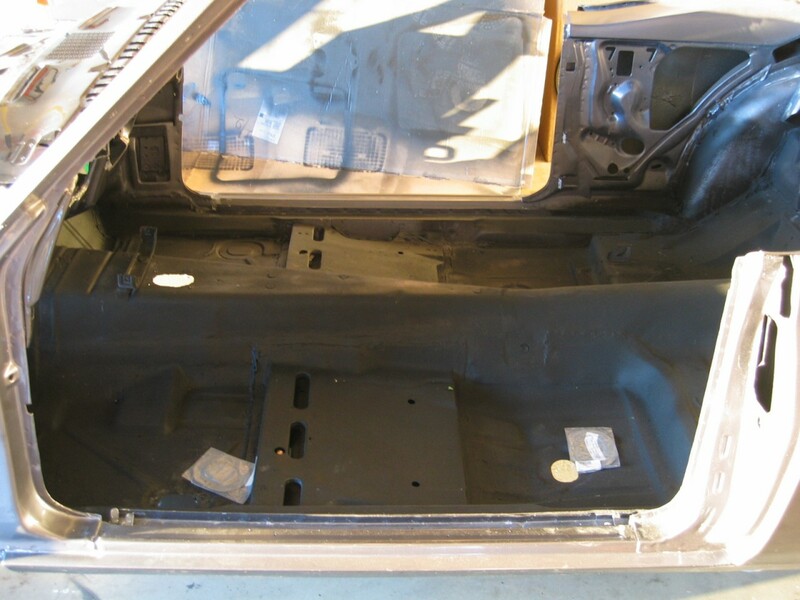 I decided early in my restoration that I did not like the look of splatter paint or the pre-formed vinyl trunk mats that many people use to restore their trunks. 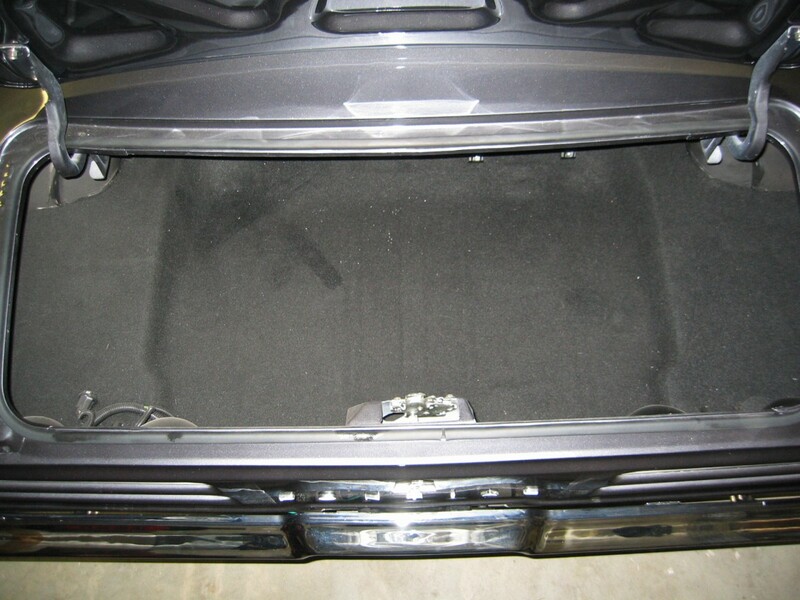 So, I undercoated my entire trunk area, covered the bottom with eDead Sound Deadening, and then layed down a special trunk upholstery material. I picked up this specialized material at my auto local upholstry store. It was cheap and very easy to cut to the shape that I wanted. 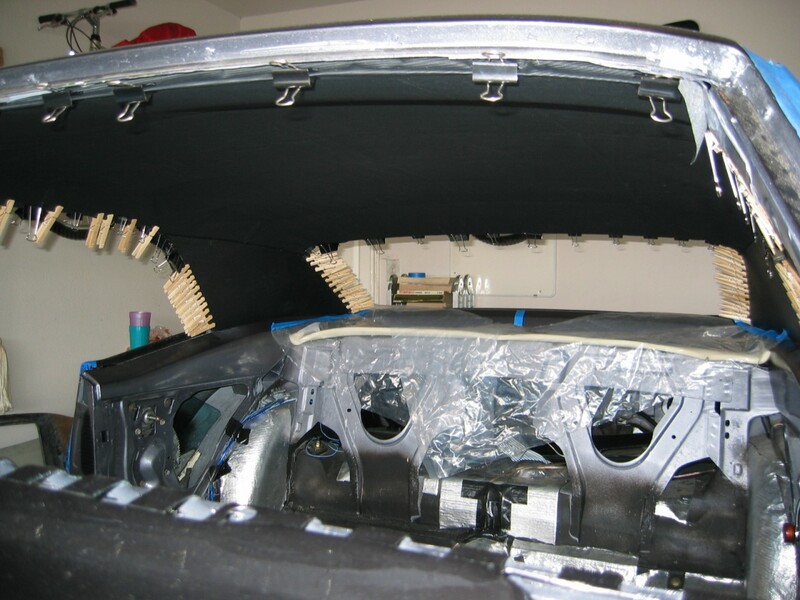 Once cut and glued into place, the material manipulated easy to form to all the curves and countoures in the trunk. I think the results were phenominal.